The Boeing Model 2 and its derivatives were United States two-place training seaplanes, the first "all-Boeing" design and the company's first financial success. Pacific Aero-Products, the forerunner of the Boeing company, built its first all-original airplane, the Model C naval trainer. A total of 56 C-type trainers were built; 55 used twin pontoons. The Model C-1F had a single main pontoon and small auxiliary floats under each wing and was powered by a Curtiss OX-5 engine. 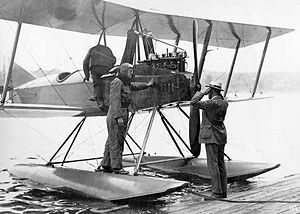 The success of the Model C led to Boeing’s first military contract in April 1917 and prompted both its reincorporation as the Boeing Airplane Company and relocation from Lake Union, Washington to a former shipyard on the Duwamish River, also in Washington. The United States Navy bought 51 of the Model C trainers, including the C-1F, and the United States Army bought two landplane versions with side-by-side seating, designated the EA. The final Model C was built for William Boeing and was called the C-700 (the last Navy plane had been Navy serial number 699). On March 3, 1919 Boeing and Eddie Hubbard flew the C-700 on the first international mail delivery, carrying 60 letters from Vancouver, British Columbia, Canada, to Seattle, Washington.